This online program takes you in 4 masterclasses through the financial, legal, organizational and administrative requirements for getting subsidies and forming winning partnerships (like Public Private Partnerships 'PPP'). Personal expert feedback on your assignments is available for you. You only need a laptop or computer with internet connection. After receipt of your payment we will send you an email with further instructions and access codes. ﻿By buying this course, you accept the general conditions. ​The Dutch Agricultural Sector is executing Public Private Partnerships ("PPP") for a long time now. In CERES a lot of experts from this sector are involved and we believe that PPP is the way forward to address the current Wicked Problems (Food Insecurity, Water Scarcity, Climate Change, Energy Shortage, Migration, Gender Inequality, Illiteracy). Governments, EU, UN, World Bank etc are looking for a new way of Development Co-operation. With 'Development Co-operation' we mean both illiteracy and immigration problems in The Netherlands (> 1 of 7 adults in The Netherlands is illiterate), and development issues in emerging countries in Africa. Because we think the difference between developed and underdeveloped lies in the chances and possibilities that are offered (by local circumstances and the availability of good education). African countries are looking for new development approaches as well, see NEPAD strategy. Public Private Partnership is embraced as a promising answer. ​We base our activities on an innovative "Model for Succesful Sustainable Public Private Partnerships for Inclusive Development, on a Pre-competitive basis". The focus of this UNIQUE MODEL is on the Meso Sector: Chambers of Commerce, Libraries, NGO's, Public and Private Schools, Universities, women networks, service organisations, grass roots organisations and social entrepreneurs (SME). ​But what is this new 'buzz word' Public Private Partnership exactly? Why is it so important? And, most importantly, how can you make use of these promising new opportunities? In our PPP course you get answers to all of these questions. ​If you wish to find out how your enterprise or institute fits in, please contact us for the Public Private Partnership Program right away! Why do we need a new development model for Public Private Partnership? The fast economic growth of many traditional Dutch partner countries requires a new way of partnership that is build on mutual benefits. Public Funding should be used to intitiate and support projects with a view that those projects will be self-sustaining and economically viable. The expansion of mobile technology and smart phones to rural communities makes information and knowledge exchange possible. 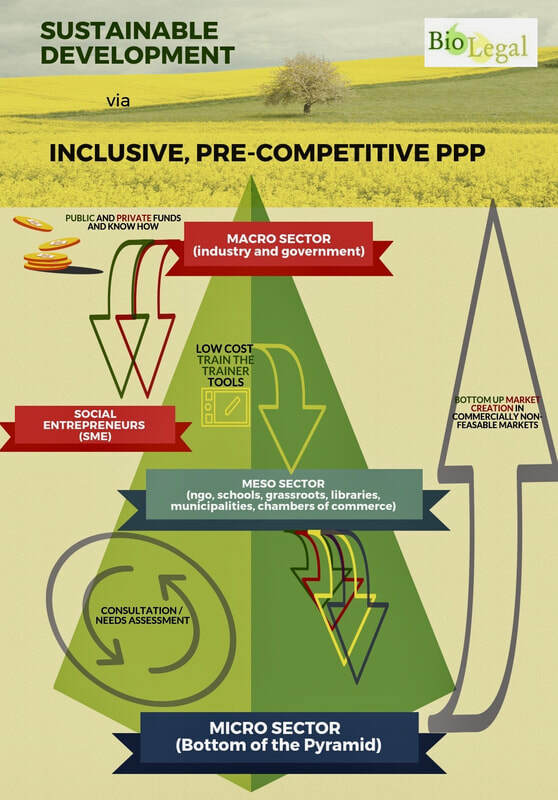 To disseminate and valorize the results obtained by publicly funded projects most effectively, the mesosector should be involved in a pre-competitive way. Traditional (multinational) Private Sector and traditional NGO's speak a different language, where 'new' Private Sector can play an intermediate role. The fast growing Private Sector in developing countries can be used as agents of change and sustainable growth, but need to develop partnerships with their counter parts in Holland and Europe. Facilitating and supporting entrepreneurship and start-ups can create local jobs while contributing to the local economy. With 'Development' we mean both addressing illiteracy and integration issues in The Netherlands, and development issues in Africa to address food insecurity, climate change, migration, and water scarcity. The difference between developed and underdeveloped lies in the chances and possibilities that are offered (by local circumstances and the availability of good education). We use African expertise to address African priorities ensuring an African solution for an African challenge. We collaborate mainly with African companies and institutions when performing services or creating products for the African market. We concentrate on Ethiopia, because of development opportunities, food and nutrition issues and a relatively stable political situation. Public Private Partnerships ("PPP") and digital tools are used to involve women in current global issues, such as food insecurity, water scarcity, migration, gender inequality, and climate change. The Agricultural Sector is a key actor in these global issues and women account for 50 to 80 % of the agricultural workforce. Women further account for most consumer’s decisions. In general, women are more micro oriented than macro oriented, which is why CERES aims at the so­-called Meso Sector (both private - SME's - and public - NGO's) to reach 'the field’. Social Enterprises are key to sustainable development and give men and women an equal chance to contribute to a better life (micro) and a better world (macro). By supporting Women Entrepreneurs many of the global problems can be addressed. This should be done from the ground up, and in a balanced way (especially when it concerns women, considering their motherhood and traditional domestic roles). This applies both for Dutch and African female entrepreneurs. That is why we developed the ﻿Entrepreneurscourse﻿.